DNP’s Hot Folder Print (HFP) Utility is a simple windows application that monitors file folders for compatible image files. 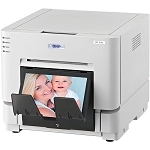 When a compatible image file is copied into a monitored folder it is sent to an attached printer for output. Each monitored file folder has a simple name such as 4×6, 6×8, or 8×10 that refers to the output size that will be produced. HFP prints a single copy of each image and then moves the image file to an archive folder. Archive folders are created automatically for each day that HFP is utilized. Works with DNP DS620A, DS40, DS80, RX1and RX1HS models only. DNP Photo Imaging America Corp.® has revolutionized dye sublimation printing with DS Series™ printers. DS Series printers are high-speed, high-quality photo printers for use in photo labs, photo kiosks, by professional photographers, or in other commercial applications. Now your customers can have Digital Prints on Demand™. DS series printers have won the DIMA Digital Printer Shoot-Out three years in a row. DS Series printers offer unparalleled reliability and ergonomic design for easy access and front loading of media. The front access panel makes maintenance easier and less time-consuming. DS40 and DS80 printers use an exclusive internal print method that safeguards the paper from exposure to dust and other contaminants. The printers feature a cartridge-based ribbon supply that makes loading fast and easy. DS Series printers have print speeds as fast as 8.7 seconds per 4x6 print. The printers are space-saving and light-weight—12.6 inches wide by 14 inches deep by 6.6 inches high and only 30 pounds. DS Series printer are competitively priced, high-resolution printers that produce rich photos that display full color details and smooth gradation. The lamination layer on the media provides resistance to fading, fingerprints, water, ozone and dust. Unlike some photo printing processes that require chemicals or liquids, DS Series printers are specifically designed to use DNP's high-quality, value-priced dye sublimation media.